The U.S. Army and other military branches have scouted for drone and autonomous technology at the U.S. Special Operations Command‘s event which exhibited prototypes and demonstrations of drone, robotics and artificial intelligence technology. 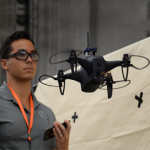 The Army said Thursday the ThunderDrone event began September at the SOCOM SOFWERX facility in Ybor City, Florida. Experts from military branches examined 30 projects from over 20 firms during the collaborative event. Ghost Robotics demonstrated its Minitaur robot designed to climb through stairs and fences. Shield AI exhibited its autonomous Hivemind Nova quadcopter designed to fly in buildings, caves and tunnels while providing video and mapping coverage. Planck Aerosystems showcased its drone designed to autonomously launch from and land on a moving vehicle. Josh Wells, CEO at Planck Aerosystems, stated that the technologies exhibited in the event were originally designed for maritime operations, but are also applicable for land use. SOCOM and the Strategic Capabilities Office plan to administer to more Rapid Prototyping Events in 2018 at the same venue were ThunderDrone was held.